The goal of the project ZEOCAT-3D is the development of a new bi-functional (two types of active centers) structured catalysts, achieving for the first time a tetramodal pore size distribution (micro-, meso1-, meso2-, macro-porous) and high dispersion of metal active sites for the conversion of methane, coming from different sources as natural gas and biogas, into high value chemicals such as aromatics (benzene, naphthalene, among others) via methane dehydroaromatization (MDA). The main drawbacks associated with this process are: Low methane conversion, low selectivity towards the desired products and the quickly deactivation due to carbon deposition onto catalyst. These problems will be overcome by the use of hierarchical zeolites structures synthetized by 3D-printing and loaded with doped molybdenum nano-oxides. The methodology of the project will go from laboratory to pilot scale demonstration in a real environment. 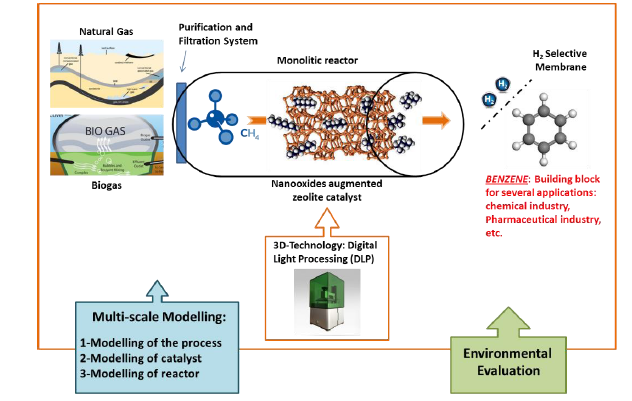 Catalyst design and operation conditions will be optimized for different methane feedstock at lab-scale and then upscaling and construction of a final prototype will be carried out. The optimisation of these catalytic processes will bring enormous advantages for increasing the exploitation of natural gas and biogas, since ZEOCAT-3D is very well in accordance with the programme topic NMBP-24, regarding development industrial process to obtain high value chemicals at the same time that the dependence from the current fossil fuel is reduced. Project management: IDENER is leading this H2020 project assuring the correct project implementation and day-to-day management tasks. Multidisciplinary Design Optimization: IDENER is leading WP2 which is dedicated to the modelling and simulation of the process. The performance of catalyst reactor formulation and implementation in MATLAB or EES will be carried out by IDE to obtain a model based on mass and energy balances.